What great nights of Community Cricket we have had on Wednesday, Thursday and Friday. It was fantastic to see so many people supporting our three Grand Final Teams – and then coming together last night in our Club rooms to share experiences together. Girls Team – On Wednesday evening, our Girls team had a fantastic win. After bowling the opposition out for 29, our Girls chased down the runs in about eight overs. This is a fantastic achievement for Coaches Chris, Jean-Paul and all of the Girls. This is only the third season that Nunawading has had a Girls team – and for them to be now ‘PREMIERS” is something we are all proud of. U12B – After being undefeated all season, the Grand Final was always going to be a challenge for Coach Jean-Paul and the girls and boys. Despite that, Nunawading played some great cricket. The match was certainly close, and after Forest Hill finished their innings, Nunawading had to make an additional 40 runs with five wickets in hand. The chase was successful, and Nunawading U12B are ‘PREMIERS’. Again, everyone is proud of your efforts. The highlight of the night for me though, was post match when Forest Hill families came into our club rooms, and both teams sat together and talked and laughed while having some pizza and a drink. This is a massive credit to both teams. U18 – Having been set 190 to win on Wednesday night, our Boys started the run chase last night against a very good Heatherdale team. The Boys gave the chase their all, however were unable to make the required runs. A lot of the boys playing in this team have been at Nunawading for the full 10 years since our Junior program re-started – many having won Grand Finals and also having some great matches against Heatherdale. Despite the loss, our young men represented themselves, their families and their club magnificently. Congratulations boys – your efforts make you winners. 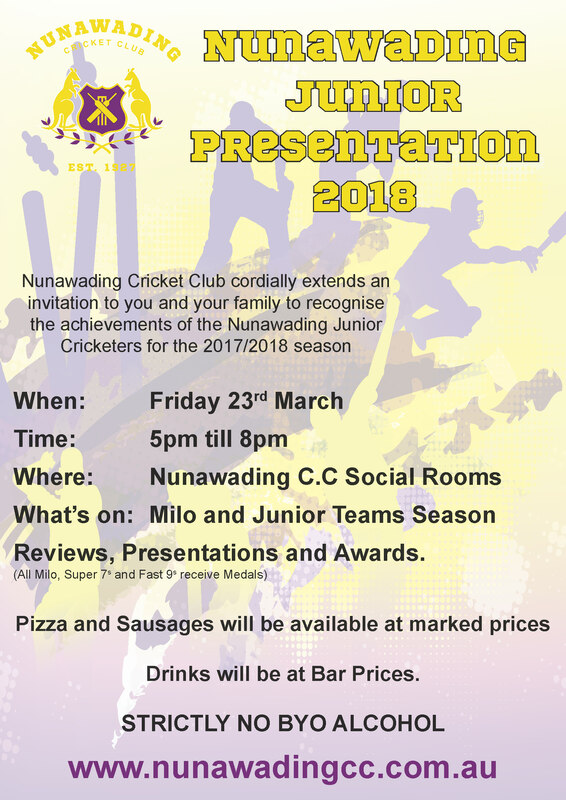 This coming Friday – 23 March is our Junior Presentation. Not only will you have an opportunity to hear more from our Grand finalists, we will hear how all our teams performed this season. Please come along for as much of the night as you can and support the different teams. Invitation attached and rundown is below. It would be great to have everyone there for dinner at 6.00pm. Immediately afterwards we will be awarding the prestigious Dave Cowell award. Dave himself will also then be providing a summary of the last 10 years of the Junior Club – since he himself started it.